Unknown to many consumers, fashion is a highly polluting industry. Chemical-based dyes and the production of synthetic fibers such as nylon and polyester, which are non-biodegradable and emit greenhouse gases, can be hugely harmful to the environment. FASHION FOR A PURPOSE. The Embassy of Sweden, in partnership with the Swedish Institute and Swedish brands H&M and Babybjörn, stages ‘Fashion Revolution: The Future of Textiles’ exhibit to highlight the importance of sustainability in the fashion industry. On top of that, shipping and manufacturing also result in a huge carbon footprint. Fast fashion has been found one of the industry’s major culprits. Since pieces are of lower quality and are inexpensive, consumers feel motivated to throw them away for new garments when the season changes. The Global Fashion Agenda and the Boston Consulting Group, Inc. estimated that 92 million tons of textile waste is produced annually by the fashion industry, and is estimated to increase by about 60 percent between 2015 and 2030. 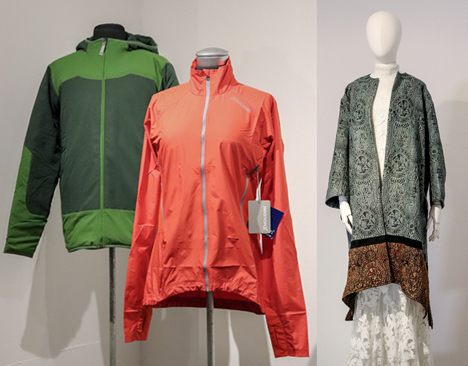 (Left) Swedish outdoor company Houdini Sportswear offers a complete range of functional and sustainable clothing. (Right) A jacquard coat made from recycled polyester on top of a lace wedding dress made from 100 percent organic cotton. That’s not to say however that fashion brands are the only ones that should be blamed. In order to become more responsible, shoppers ought to do their research to find brands that put sustainability at the core of their business model. Given these circumstances, the Swedish fashion industry continues to recognize the importance of sustainability in business, and incorporate green practices into their supply chain. 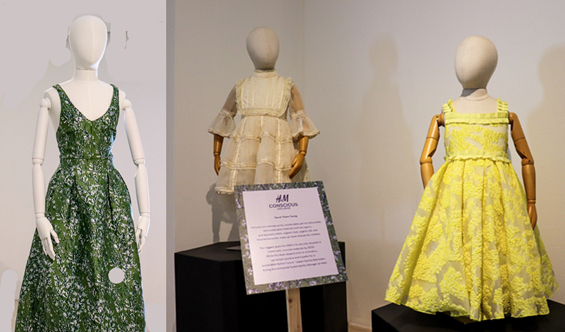 With the aim to showcase innovative fashion garments that are produced sustainably in various strategies, the Embassy of Sweden Manila partnered with Swedish Institute and Swedish brands H&M and Babybjörn to launch “Fashion Revolution: The Future of Textiles” exhibit at the Metropolitan Museum of Manila. The exhibit, which is ongoing since Jan. 30 until April 30, features women’s apparel, bags, and baby equipment crafted by Swedish brands H&M, Filippa K, Babybjörn, Re-Kanken, Tierra, Lindex, and Houdini. 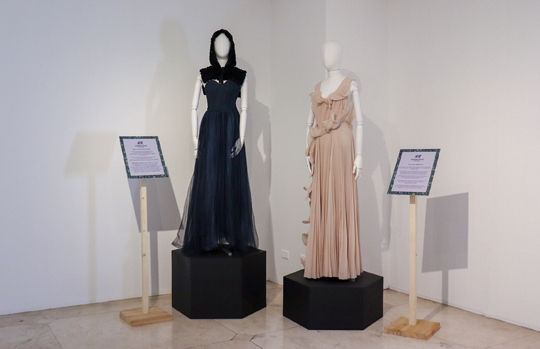 H&M, the world’s second-biggest fashion retailer, flaunts its exclusive collection of elegant dresses made from sustainable materials such as organic silk, recycled cotton, organic linen, and recycled polyester at the Fashion Revolution exhibit. The H&M Conscious Collection features a pleated blush-colored gown made from Bionic Yarn, a polyester made from recycled shoreline plastic; and an embroidered green dress made from 96 percent polyester, among others. Each piece from the collection is made from the highest quality material, making it very precious but not fragile. “The way to go really is for brands to come together and join forces with us in promoting sustainability so that we can create more demand for the government and for the various public and private sectors,” H&M head of communications and press Dan Mejia told Manila Standard. 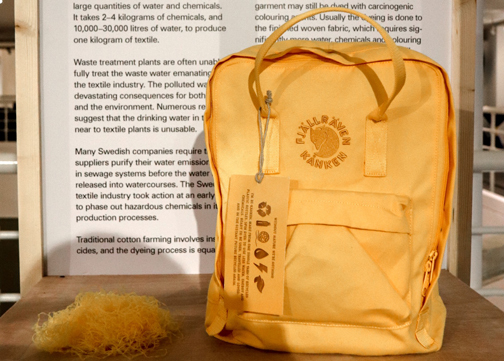 One Re-Kanken backpack is made from one single yarn of 11 recyled bottles. Alongside the exhibit, the H&M is offering guests with one 15 percent off voucher for every bag of unwanted garments that they turn over.